The Rt. Rev. Maurice M. "Ben" Benitez, 6th Bishop of Texas, died Thursday, February 27 in Austin, TX. Please keep Bishop Benitez's daughters, Jennifer Shand, Leslie Benitez, and Deborah Smith, and their families in your prayers. Two funeral services for Bishop Benitez will be held on Monday, March 3 at 3 p.m. at St. Luke's on the Lake, Austin (5600 Ranch Road 620 North), and on Thursday, March 6 at 12 p.m. at St. John the Divine, Houston (2450 River Oaks Blvd). At both services, bishops and priests are invited to vest (cassock and surplice, white stole). May the souls of all the faithful departed, through the mercy of God, rest in peace. Amen. The Rt. Rev. Maurice “Ben” Benitez, Sixth Bishop of Texas, died Thursday, February 27, 2014 in Austin. He was 86. Previous to being elected bishop in 1980, he served as rector of St. John the Divine, Houston, and had previously served churches in Florida and San Antonio. Bishop Benitez graduated from West Point in 1949 and was commissioned in the U. S. Air Force, when he met and married Joanne Dossett. In 1950 the couple was stationed at Williams Air Force Base, Chandler, Arizona, where Bishop Benitez flew jet fighters, later serving with the 527th Fighter-Bomber Squadron in Germany during the tense days of the Cold War. In 1955, he entered seminary at the University of the South, Sewanee, TN, and was ordained in 1958. He served at St James’ Episcopal Church, Lake City, FL, and at St John’s Cathedral, Jacksonville, FL, before being called as rector of Grace Church, Ocala, FL. His years at Grace were marked by tensions of the civil rights movement. Bishop Benitez received threats an d hate messages as he stood against segregation, integrating his parish school even before the public school system did the same. He was held in such wide respect that when the public system’s teachers later went on strike, he was asked by both sides to act as mediator. He was called as rector of Christ Church in San Antonio in 1968 where his reputation and energy for evangelism continued to grow. Bishop Benitez came to St. John the Divine, Houston, as rector in 1974, where he implemented popular forms of Christian renewal and evangelism. During his 15-year tenure as bishop (1980-1995), the Diocese continued to present more people of all ages for confirmation than any other diocese in the Episcopal Church. Bishop Benitez was widely regarded as a friend of the popular renewal movement in the Church and early in his episcopacy, he conducted a Venture in Mission campaign to support domestic and world mission. Bishop Benitez provided strong leadership in the nascent years of the Episcopal Foundation and founded Episcopal High School in Houston, raising more than $40 million over a 12-year period for land and construction. The School’s chapel is named in honor of Bishop and Mrs. Benitez. Bishop Benitez served as chair of St. Luke’s Episcopal Hospital and provided leadership during a period of growth for the hospital and the Texas Heart Institute. While he was bishop, the Diocese’s Quin Foundation more than doubled its value and Camp Allen added a third campsite, a lake and a chapel to respond to growing needs of youth from the Diocese’s 150 congregations. Bishop Benitez also brought a focus on the changing demographics in Texas. 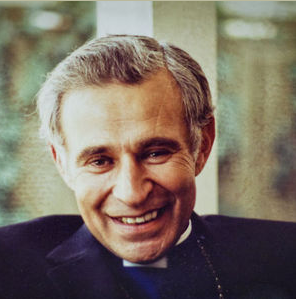 While he coped with challenges to the Church brought by the recession in the late 1980s, the collapse of the oil business and the resulting banking crisis, he laid the foundations for a vibrant Spanish-speaking ministry in the Diocese, opening the first Hispanic missions, recruiting Spanish-speaking clergy and appointing the first Hispanic missioner for the Province. He responded to the increasing Hispanic populations’ needs with the establishment of El Buen Samaritano, the diocesan social service agency in Austin. Bishop Benitez served on the Executive Council of the Episcopal Church, and for 12 years on the board of the Church Pension Fund as well as chair of Seminary of the Southwest in Austin. Bishop Benitez was predeceased by his beloved wife of 63 years, Joanne, and is survived by their three daughters Jennifer Benitez Shand, Leslie Anne Benitez and Deborah Benitez Smith, grandsons Ben Shand, Peter Shand, Isaac Young, Evan Young, Taylor Smith and Charlie Smith, and by his sons in law, the Rev. William M. Shand, III and Dr. James L. Smith, Jr.
Services for Bishop Benitez will be held at St. Luke’s on the Lake, 5600 Ranch Road 620 N. in Austin on Monday, March 3 at 3 p.m., and at St. John the Divine, 2450 River Oaks Blvd. in Houston on Thursday, March 6 at 12 noon. Memorials are suggested to the Episcopal High School (www.ehshouston.org), Camp Allen Conference & Retreat Center (www.campallen.org), or to one’s home parish. Obituary and memorial guestbook available online here.